An original painting & prints of Kelvingrove Museum & Glasgow University during sunset, Scotland. An original abstract & atmospheric contemporary landscape painting. Kelvingrove Museum and The University of Glasgow at Kelvingrove Park catches the sun going down during the winter months in spectacular fashion. The sandstone of the building glows reds and oranges as the low sunlight drenches it just before the sun goes. This is one of my favourite views when on my way home from the studio in Glasgow in the wintertime. A mix of mediums are blended, layered, sprayed, scraped and splattered over the canvas to produce a very unique & atmospheric painting, depicting the amazing colours of the buildings during sunset in Glasgow. Painting & prints of Kelvingrove Art gallery and Museum, Glasgow by Andy Peutherer. Framed prints of Kelvingrove Art gallery and Museum, Glasgow by Andy Peutherer. 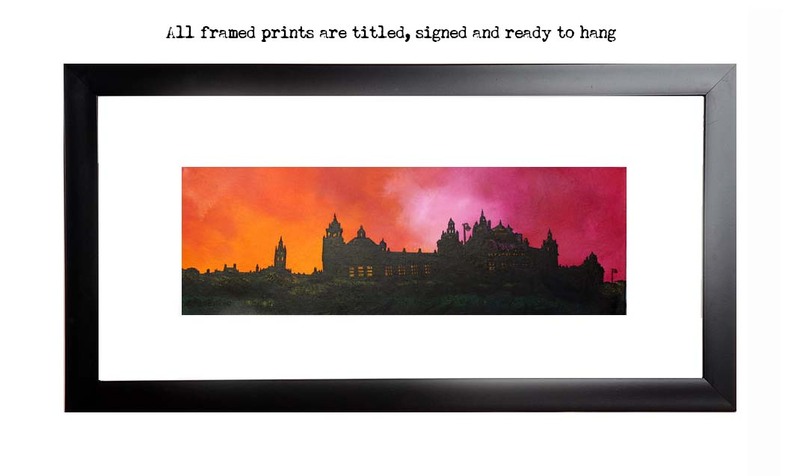 Painting & Prints Of Glasgow - Kelvingrove Museum and Glasgow University Sunset, Scotland.